Smooth drywall ceilings (all living areas). Garage tapped and bedded all walls. Sherman Williams rolled on walls (two coats). One main color selection; white semi-gloss enamel on trim in finished living areas (excluding hand rails). Two additional custom colors included. Gas (if available) fireplace with Marble Surround and Mantel four choices. Stone surround an additional charge. Vinyl (white) Andersen Silverline, single-hung, tilt-in (bottom sash) windows with 7/8” insulation spacer, grids (between panes) in windows on front elevation and screens throughout living area. Maintenance-free aluminum & vinyl exterior soffit, facia. Concrete stoop on front porch and rear porch. Price includes wiring for ceiling fans in Great Room, Rear Porch and Master Bedroom. All other bedrooms will have ceiling lights. 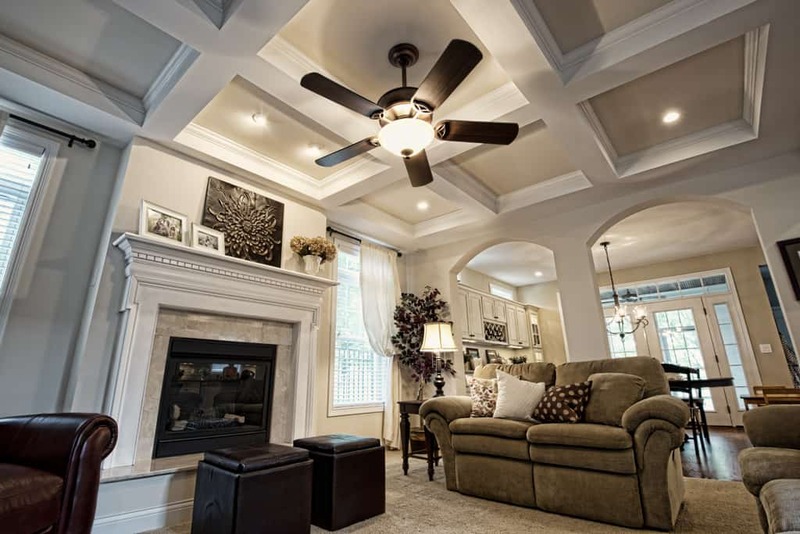 Allowance of 12 recessed can lights in Kitchen hall ways and great room ceiling. One vanity outlet over each vanity sink, wiring for two hall lights, foyer fixture, dining & breakfast room fixture, walk in closet fixtures. Basement and garage to have exposed bulbs based on code. Home is priced for coach lights per elevation. No flood lights included.